Last month I was in Cornwall, in the romantically-named Marazion, right opposite St. Michael's Mount. We visited it twice (not for the first time), once by walking the causeway and once by boat. 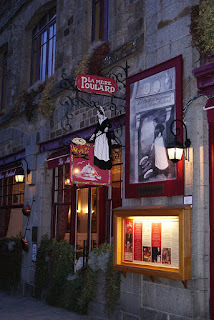 And a few years ago I spent a long weekend on Mont Saint-Michel in Normandy, researching for an adult novel. The French island is much bigger than its Cornish counterpart but I started wondered why there were two such similar geographical entities so relatively close together, each topped with a castle or abbey and each dedicated to the Archangel Michael. We know him as a protector and defender, the one whose role during the "war in Heaven" was to defeat the apostate angel who became Satan. But he was also the stern preventer of any return to Eden by the exiled Adam and Eve, barring their way back with a fiery sword. As early as the 5th century there was a legend that St. Michael had appeared to fishermen on the mount that now bears his name. But it is the French tidal island that is the senior mount. Until 708 when St Michael appeared in a vision to the Bishop of Avranches, Mont Saint-Michel was called Mont Tombe. The vision was to urge the Bishop to build an oratory on the top of the islet, which he duly did, perhaps encouraged by the saint laying his finger on his head so firmly that after death the Bishop's skull shows the indentation. Over the next few hundred years the building was extended and became a monastery dedicated to St. Michael. The Abbey at Mont Saint-Michel, as the monastery is known, became a place of pilgrimage but as it grew in wealth, so it became a less holy and more venal place. Richard, Duke of Normandy decided to cleanse the Augean stables and institute the Order of Saint Benedict at the Abbey and return it to a more devout life. The Benedictine monastery gave its support to William the Conqueror's claim to the English throne and is even depicted, rather quaintly, in the Bayeux "tapestry." These panels show Harold Goodwinson rescuing two Norman knights from the quicksand in front of the island. 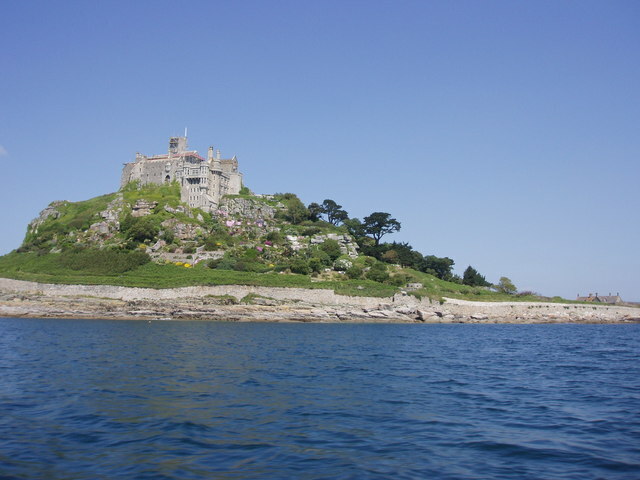 William was so grateful for the monastery's support that he gave property on the other side of the channel to Mont Saint-Michel, including the rocky little island off the Cornish coast near Penzance. A monastery was built on the Cornish island too, in the 12th century, but it could not be on the scale of its Norman counterpart. Both religious houses were dedicated to Michael the Archangel. But the association of the two islands and their monasteries came to an end in 1424, as a result of Henry V's wars in France and there is now no connection except a strong family resemblance. 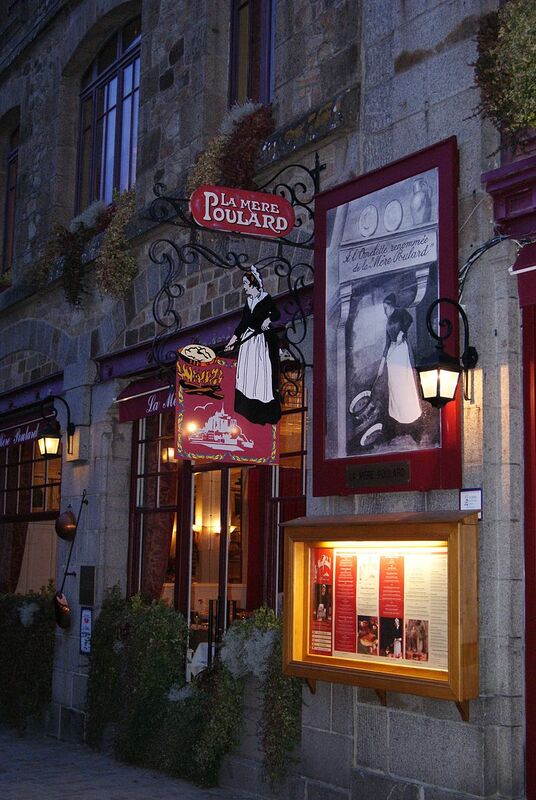 The Mère Poulard was famous for its omelettes and day and night I could hear the eggs being whisked in a copper bowl. But the shops are full of touristy tat and the restaurants incapable of understanding vegetarians, or at least they were a few years ago. You can probably tell that I prefer the smaller Cornish poor relation with its two cafés and two shops. Mont Saint-Michel is reached by a causeway wide enough to take a coach. 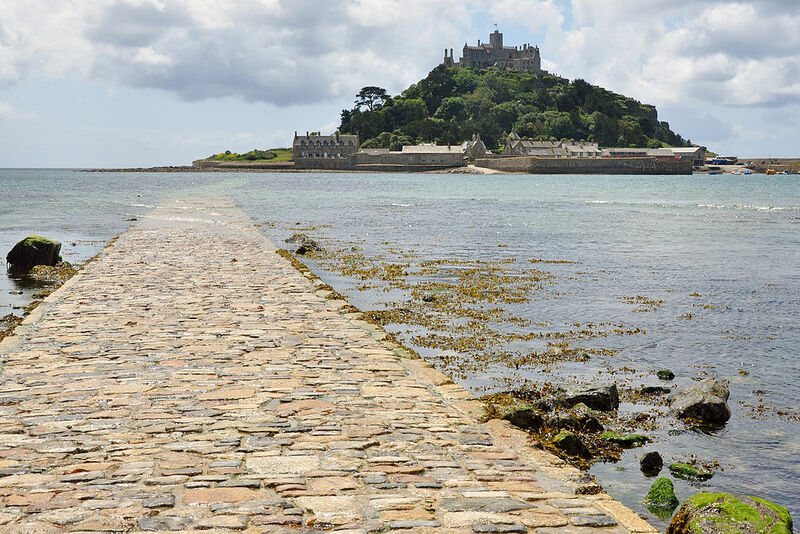 In contrast, you reach Saint Michael's Mount by a narrower man-made causeway which appears at low tide. Once across the causeway, you can climb up the the castle on the top. At least, if it's not battered by high winds, as it was on our first attempt last month. The original church was destroyed by an earthquake in the 13th century and re-built a hundred years later. It is still used as the castle's chapel. Now it's a castle with a stately home attached, the home of the Lords St Levan, whose family name is St. Aubyn. 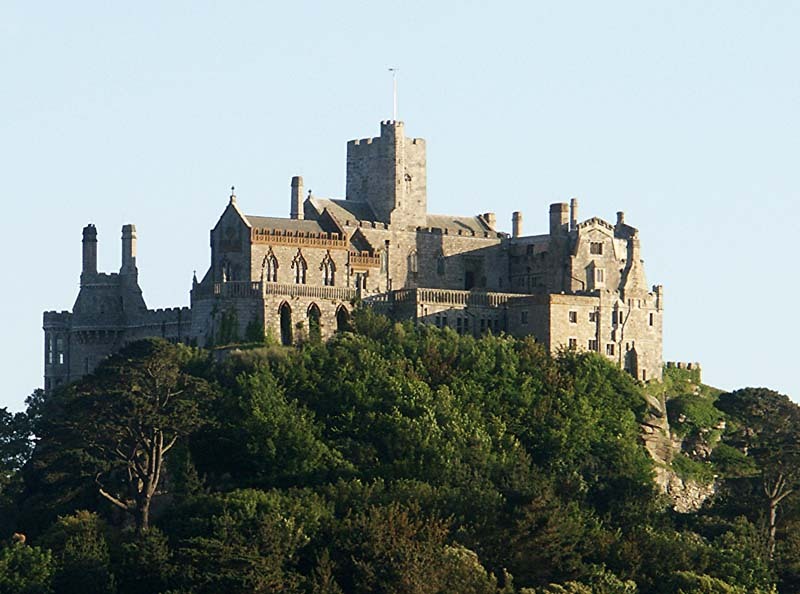 Have any of you ever visited either of St. Michael's mounts? And can anyone think of two other places with the same name and appearance but in two different countries? No, I've only ever connected it with the Arthurian story, with a giant and a rescue. And the giant slain by "Jack" here was Cormoran after whom JK Rowling named her character Cormoran Strike in her Robert Galbraith novels. 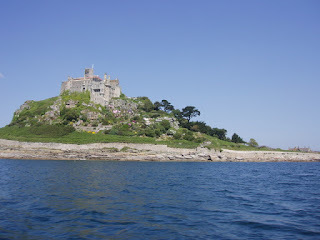 I was in Cornwall in July and enjoyed seeing St Michael's Mount though didn't cross as the tide was in. I wondered then about the connection to Mont Saint-Michel which I visited several years ago so am delighted to know the answer. Thank you. Thanks for this, Mary. I'd always assumed there must be some connection between the two, but didn't know what it was. I remember going to St Michael's Mount years ago when our children were young, and walking back across the causeway, which of course they loved. I can't remember anything about the island, but there's something very appealing about a pathway that's not always there. I read a story once about Mont saint Michel which indicated the place had lots of caves under it, many of which are crypts. I visited St. Michael's Mount in Cornwall way back in 1993 but haven't yet been to Mont St. Michel. Still on the bucket list though. I've been to both. I found Mont St Michel amazing, but you had to ignore the tourist tat, as you say. Love the memory of the Cornish one hovering off the coast, but the day we actually walked over there, in early July, it was chilly and windy and halfway across the causeway the rain came on, and by the time we arrived, I was saying: 'I want to be in Italy!' So the following year, there we went. Given that we love visiting the west of Ireland, I think it must have been really nasty that day, though on other days Cornwall was even warm enough to swim in British waters! Another dream island is Lindisfarne. I have been there twice, once when I was a student, then about eight years ago when we had a holiday in Northumberland, in the autumn. It is such a wonderful, atmospheric place..